BB PRO TIP: When aiming for a faux bob, remember that volume is everything! 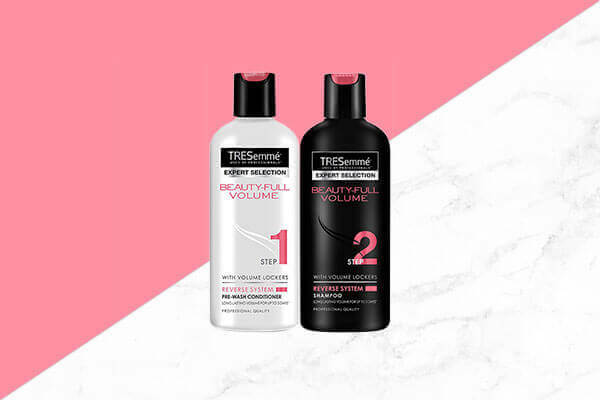 So the key is getting your products right, and what better than the TRESemme Beauty-Full Volume Shampoo and Conditioner to achieve this! It comes in with a unique reverse system where you condition your hair first and then shampoo it. This ensures complete nourishment to the hair without making it sticky or weighing it down. It also gives you a better blow dry! Our favourite Khaleesi Emilia Clarke was spotted adorning a stunning wavy faux bob with so much ease! We honestly love the muted makeup and statement jewellery that’s complementing her look overall! Emily Ratajkowski’s hair is super enviable especially when we know she can rock a faux bob so effortlessly; it’s almost as if it’s a real bob! We love the soft, textured waves too! The Versace on the floor star, Zendaya sported a textured faux bob giving all of us a reason to not chop those locks off! This easy-breezy hairstyle is achievable with some texturising spray, lots of bobby pins, a hair setting spray and not to forget, lots of confidence! Disha Patani made our jaws drop when she showed up in a vintage faux bob at an award show! What added to the look was her wine velvet gown that made us take a trip back to the 60s! Remember when Amber Heard made heads turn during the Golden Globes 2016? She sported a sleek faux bob, which gave us major retro vibes! Literally the hairstyle that can never go wrong! Freida Pinto’s chocolate brown hair with a hazel balayage peeking through, neatly tonged into a soft wave in the front is what hair dreams are made of! We can’t take our eyes off her perfect hair and makeup that she sported at a film fest not too long ago. Now that’s a noteworthy throwback! Celebrity hairstylists are constantly pushing the envelope with the crazy, innovative and out of the box hairstyles and red carpet events are like a canvas for them to experiment all they can; the faux bob hairstyle being one among the many. We can’t wait to see what red carpet hairstyles we will witness in 2018!